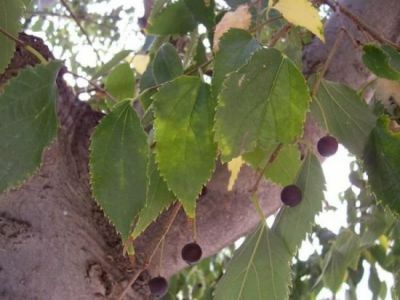 Celtis australis fruit, leaves, bark. Photo by Vito Buono – Bari. luirig.altervista.org (Accessed 12/2017). 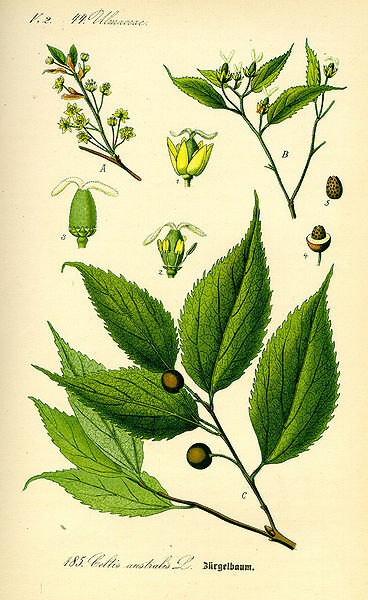 Celtis australis is a tree to 25 m tall; twigs densely hairy, (bark of smaller branches dark gray, sprinkled with very small orange-brown lenticels, in this specimen). Leaves alternate, stalk 0.5-1.5 cm long, densely hairy, blade elliptic to egg-shaped, 5-15 cm long, tip long-pointed, base rounded, sides unequal (oblique), (this specimen cordate with wide, shallow sinus, midrib and one vein on either side slightly extended down stalk), margin coarsely toothed except at base, veins palmate at base, hairy on veins below, rough and slightly hairy above, dark green, above paler below. Flowers polygamo-monecious, staminate flowers yellow, pistillate flowers dull white, small. Habitat: Ornamental from old part of NY Botanical Garden. Specimen keyed out in Rehder (1986), no fruit or flowers.